Elevator, Media/Game Room, Vacuum System, Walk-In Closets. Air Conditioning, Cathedral/Vaulted/Trey Ceiling, Central Vacuum, Elevator, Furnished, Granite Counter Tops, Home Theater Equipment, Walk-In Closet, Washer and dryer. 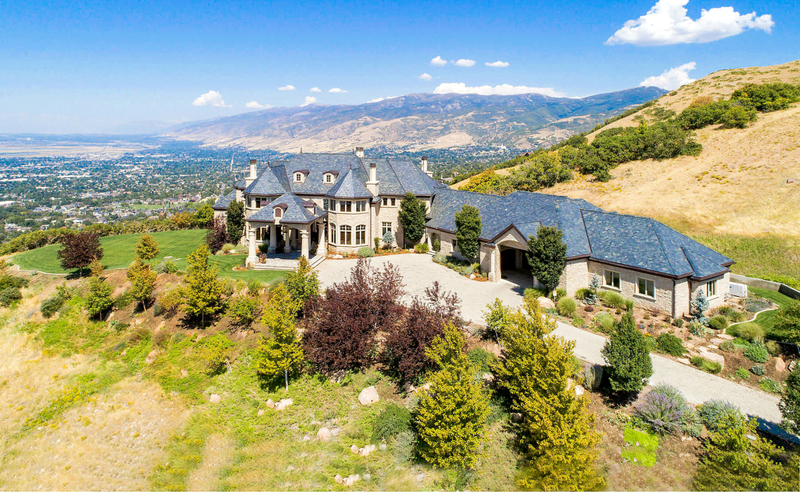 Magnificent Chateau with panoramic views of the Great Salt Lake and mountain landscape. This residence has a tumbled stone facade, slate roof, cooper accents, porte cochere and 5-bay stone motor court. The grand foyer's sweeping double staircase, hand carved Italian limestone archways and French limestone floors showcase the exquisite materials found throughout the home. The formal living and dining rooms are perfect for intimate or grand gatherings. The chef's kitchen is equipped with professional grade appliances and is accompanied by a butler's pantry, kitchen office and separate food storage room. This entertainers paradise has a walk-out lower level family room with a second kitchen, indoor basketball court, bowling lane, exercise room, playroom and media room. Other features include smart technology, Lutron light system, in-floor radiant heat, generator and an elevator. The 13.62-acre grounds include an expansive flat lawn area with trails that extend up the mountainside.